Have you thought about having a class pet, but don’t want to add one more thing to take care of in your classroom? Well, I have the perfect solution---a take-home stuffed animal! 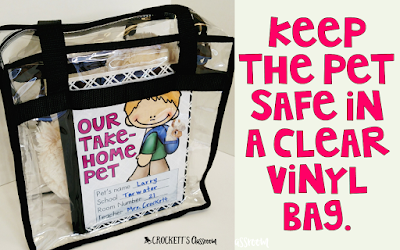 Kids love it and there is no cage or tank to clean out! Having a traveling class pet was by far the most popular class pet I ever had. Kids couldn’t wait to for their week to take home the pet and have it be part of their life for a few days. Of course, I had to include a journal for the kids to write in through the week. Tips for having a take-home class pet. 1. Choosing a stuffed animal is the easy part because kids love them all. But, keep the size of the pet in mind. Too large and it's difficult to transport home and then back to school. Too small and it feels too much like a toy instead of a real pet. 2. Pick a traveling bag for your pet. I like clear plastic bags so everyone can see the adorable pet inside. Make sure it's large enough to hold the pet and the journal. I found this bag on Amazon for under $10. 3. Decide on the requirements for the journal. The requirements should be based on the writing level of your students. Kindies can have a drawing journal where they draw a picture or two that shows what they did with the pet. Firsties can write a few sentences along with illustrations. For older students, they can write paragraphs and add illustrations. 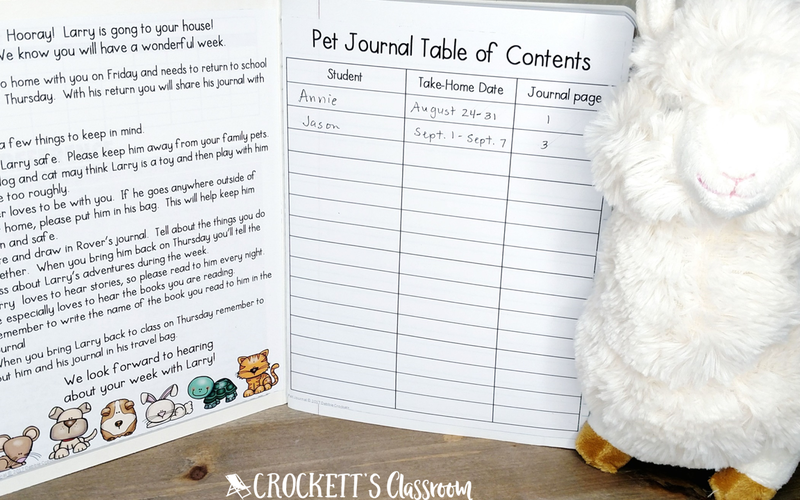 Make sure all requirements and suggestions are included in the journal, so kids know exactly what is expected. 4. What will you use as a journal? I like using a composition book. It's sturdy and will last the whole year. You can glue on a cover and then glue all instructions and suggestions to the inside cover. Click here to download this freebie for setting up your Take-Home Pet Journal. 5. Make sure you share the journal on the day it's returned and before it goes home with a new student. 6. 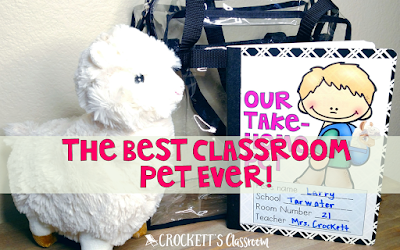 A letter home at the beginning of the year, explaining the Take-Home pet is a good idea. That way, parents know what to expect. I also let parents know the take-home schedule a few weeks in advance. That way, the schedule can be adjusted if a family needs to reschedule the pet's visit to their home. Above all, have fun. 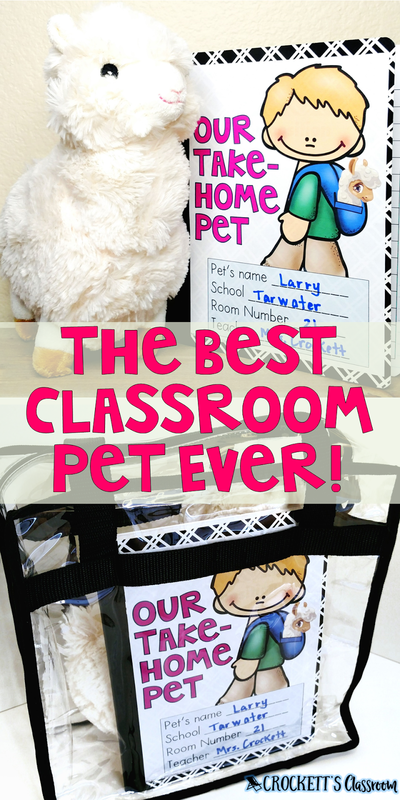 Just like a live pet, the stuffed animal pet is a great way to teach responsibility.